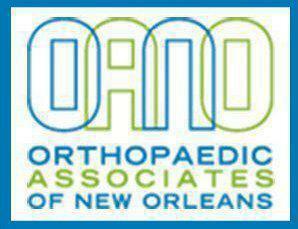 Orthopaedic Associates of New Orleans always appreciates feedback from our valued patients. To date, we’re thrilled to have collected 32 reviews with an average rating of 4.94 out of 5 stars. Please read what others are saying about Orthopaedic Associates of New Orleans below, and as always, we would love to collect your feedback. I was so nervous and Jason had a calming bedside manner and put me at ease as best he could. Was seking diagnosis of recent chronic knee pain. Dr. Estrada's office efficiently took two required X-rays. Dr. Estrada quickly reviewed the data, was able to provide a definitive diagnosis of osteo-arthritis within minutes. He then adminstered a cortisone shot and dispensed a prescription for an NSAID (non-opiate pain reliever). He recommended a wait and see monitored approach to any future surgical procedure. Since the office visit, the knee is feeling much better and the swelling is gone. I have my life back for now and i really appreciated his clear explanation of the condition! As always you leave the office in better shape than when you entered. A true asset to the medical community and to No La. I've been coming to this clinic since Dr. George Cary was there. I like the care and would not go anywhere else. My mother had surgery on her spine that lasted 5 hours and Dr. Felipe Ramirez and his staff showed exemplary skill and patience with her. I wasn't expecting such a blessed outcome, but it was a job well done. Even though I was not in the computer, the receptionist called the doctor and I was seen right away. Very kind, courteous and professional! Love Doctor Estrada! From the moment I walked in to Dr. Lurie's office to the moment I walked out I had friendly staff that greeted me, the medical assistant was very nice and understanding to my all my needs and needless to say, Dr. Lurie took the time to explain all my options and answer all my questions. I recommend Dr. Lurie to anyone that needs a great Orthopedic surgeon.